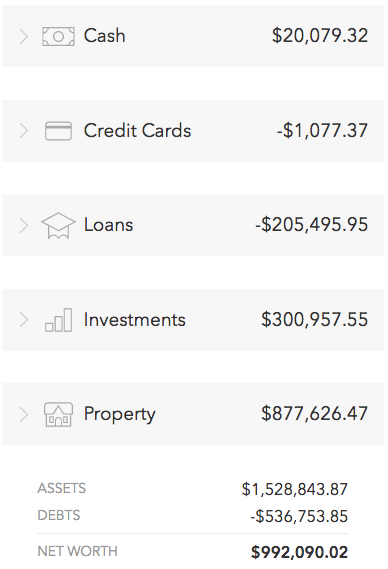 Just logged into my Mint.com account and noticed that we hit another major financial milestone: our investments have now surpassed $300,000 in value! With the recent run up in the stock market, our investments have been producing a healthy amount of returns. It’s amazing how our investments continue to compound with no maintenance on our end. In the last 6 months, the S&P 500 has increased by 10.6%. In the same 6-month period, our investment accounts have increased by $50,000. Two years from the date our investments surpassed $100,000 in value (June 2, 2014), our investments have now increased by another $200,000 in value. We are far from reaching financial freedom, but headed in the right direction. We have been steadily and consistently contributing to our 401Ks, IRAs, taxable accounts, and 529. I haven’t written much about investing lately because it really doesn’t need to be as complicated as financial pundits would have you believe. There’s no special magic to investing. Millionaires are made $50 at a time (minimum contribution at Vanguard). I’m not a financial expert; I simply believe the studies that consistently report that index funds beat stock pickers handily over and over again. We basically follow the Bogleheads investment philosophy: invest consistently in low cost index funds, diversifying our investments, never trying to time the market, and staying the course with our investments. Warren Buffett, the greatest “stock picker” of our time, recommends investing in index funds. In 2005, Buffett offered to wager $500,000 that NO investment professional could choose a set of at least five hedge funds that would beat the performance of a low-cost S&P 500 index fund over a 10-year period. One hedge fund manager named Ted Seides took the bet and raised the stakes to $1 million. The results of the wager came in with the Vanguard S&P 500 fund up 85% while the hedge fund came up a dismal 22%. You can read more about the story here. I’ve written a simple investing primer starting here. If you are looking for more of an in depth read, you cannot go wrong with financial blogger Jim Collins and his Stock Series posts here. He recently wrote a great post on the importance of staying the course even while the market may be at an all time high, because no one knows what the future holds. The market will go up, and the market will go down - just keep steadily contributing. Your time IN the market is much more important than TIMING the market. Those that try to fiddle with their portfolio too much end up making much less than those that just leave their portfolio alone. For those of you that enjoy listening to podcasts, you can hear an interview with Jim Collins on the ChooseFI podcast. A large amount of our net worth is in real estate, our home and our rental property. Our main "Loan" is the mortgage on our rental property. Our mortgage company does not link with Mint.com so I have to manually update our mortgage loan balance in the "Property" category. If you are just getting started with investments, realize that while the best time to have started investing was when you first started making money, the second best time is right now.